Recent statistics suggest that diabesity could be the leading cause of chronic disease and death and its impact is expected to dramatically rise in the next quarter of a century. It affects more than a billion worldwide - about 100 million Americans 50% of whom are over the age of 65. India is bracing for massive surge in diabesity estimated more than 100 million in the next 20 years. Infertility is commonly associated with diabesity and in India 70% of infertility cases are reported with diabesity issues. Patients with diabesity also have low sexual drive or sexual dysfunction problems. A term coined by Dr. Francine Ratner Kaufman, MD - Professor, Author, Consultant in Diabetes, Endocrinology and Metabolism, diabesity is diabetes + obesity, because of the intimate and strong relationship between obesity and diabetes. Diabetes is a disease characterized by high levels of glucose in the blood which is due to the body's inability to produce or effectively use insulin. Type 2 diabetes is closely associated with excess weight and obesity. Hence, researchers have referred to this phenomenon as diabesity. Obesity and diabetes are linked, as higher than normal body weight greatly increases the risk of diabetes. An estimated 80% of diabetes cases are related to obesity. Little wonder that obesity with increased diabetes is called diabesity. Diabesity is increasing at an astonishing rate now. While twenty years ago not a single nation had obesity rate over 20 %, today, not a single nation has an obesity rate under 20%. While 13% adults in the US have diabetes, it is becoming increasingly prevalent among children and adolescents as well. Type 2 diabetes accounts for about 95 % of diabetes cases and is thrice as common in the US today as it was forty years ago because of its sister health concern, obesity. Nearly two-thirds of those in the US are overweight and one-third obese. With such obesity in adults, the incidence of overweight children and adolescents ages six to nineteen have tripled. Those with family history of diabetes, heart disease and obesity are predisposed to have diabesity. In women, if the waist is more than 35 inches and in men if it is more than 40 inches and they have craving for sugar and refined carbohydrate, then a checkup for diabesity is a must. The complications - diabetes, elevated blood sugar, blood pressure and cholesterol are all symptoms that result from problems with diet, lifestyle and environmental toxins interacting with our genetic susceptibilities. Diabesity results from dietary and lifestyle factors as they create a condition known as insulin resistance and this is the real driver of problems with diabesity. High insulin level is the first sign of the problem. The body starts to age and deteriorate. It leads to premature aging and resultant diseases such as heart disease, stroke, dementia and cancer. Weight gain around the belly, inflammation and oxidative stress, downstream effects of high blood pressure, high cholesterol, low LDL, high triglycerides, weight gain and thickening of blood and increased risk of cancer, Alzheimer's and depression are other prominent causes. Both diabetes and obesity are linked to the same health complications such as cardiovascular diseases and cancers. Conditions such as obesity, insulin resistance, metabolic syndrome and Type 2 diabetes have reached epidemic proportions now. Diabesity is a metabolic dysfunction that ranges from mild blood sugar imbalance to full-fledged Type 2 diabetes. Not only do they share the same underlying causes but they also require more or less the same treatment. These are mostly preventable and in many cases, entirely reversible. Going on to explain the roots of diabesity quite simply, Dr Kaufman says "Our bodies store excess calories as fat. In ancient times calories were hard to come by. Today, fast food and junk food are everywhere. Coupled with our increasingly inactive lifestyle, the result is obesity. Diabetes is everywhere around the world, and it touches people, whether they are a person with diabetes or a person caring for someone with diabetes. It has global reach and global impact. We need to come together as a global society to find a way to combat diabetes." Numbness and tingling sensation in the extremities. In conventional medicine, the harbingers of diabetes can go undetected for years as it persists in late detection by waiting for blood markers to reach critical levels. This is because conventional medicine waits till blood markers reach critical levels and it does not relate to the lethal factors linking obesity and diabetes. As excess fatty tissue floods the body with harmful signaling molecules, a pathological cascade is triggered impairing their response to insulin and leptin and hampering their ability to metabolize sugars, fats, and protein. Some people think of diabetes as 'just a little sugar' and a common family problem and fail to understand the seriousness of the disease that can be crippling and often fatal. Poor nutrition is a huge precursor of obesity. As the body begins to slow down, since it is not getting the proper nutrients, it becomes more difficult to lose weight. Fast foods and restaurants are too busy to slow down for a healthier meal and so they provide meals high in calories and low in nutrition. Vegetables and fruits, on the other hand, are low in calories and high in nutrition. Eating these will help lose weight and feed the body at the same time. Dietary management is important to reduce cardiovascular risks associated with central obesity. Patients are advised to restrict carbohydrate and total calorific intake and eat foods with low glycemic index to reduce post prandial rise in blood glucose. When dietary management fails to impact, pharmacological interventions are added. Metformin is recommended as first line treatment and when this fails, other agents are added to provide combination therapy. It is important to understand that any such pharmacological interventions can be consumed only after prescription by a medical provider. Obesity is curable although the treatment is ineffective without proper diet plan and regular exercise. Those with BMI of more than 32 kg/m2 or more may need regular exercise and drugs as well as surgery to get the desired results. Bariatric surgery for weight loss is regarded as an effective approach by the National Institute of Health of USA. All bariatric surgeries are done laparoscopically by making small incision ranging from 5 to 15 mm, through which the surgeon inserts laparoscopic instruments to perform the surgery. Nowadays with the advent of new stapling devices, the risks associated with the procedure are lesser. The patient can go home after two to three days and start their routine work after one week and strenuous activity after six weeks. The diet after surgery goes through various phases starting from all liquid diet to semisolid to regular diet over six to eight weeks. This is a promising option for those with BMI 32.5 kg/m2 and above when associated with Type 2 diabetes, hypertension and sleep apnea. Surgery aims to decrease the body weight and help control related co-morbidities like diabetes and thus help to improve the long-term quality of life. The latest epidemic of diabesity will escalate to 366 million worldwide in 2030, 2 with an 8-10 year reduction in life expectancy. 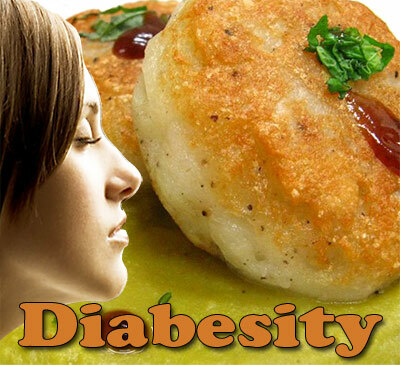 Since diabesity is a direct outcome of diet and lifestyle, this condition is reversible in a vast majority of cases. If those things that are sending the body out of balance are eliminated, then the body rebalances itself. Getting the right tests done: While most doctors focus on fasting blood sugar; this is a poor indicator of diabesity. The Insulin response test wherein insulin levels are measured after fasting and then after 1 ½ hours after glucose drink, is the best. Getting smart about nutrition: by eliminating sugar and processed food, including real foods like lean protein, veggies, nuts, seeds, beans and whole grains. Getting the right supplements: a good multivitamin, vitamin D, fish oil and special blood sugar balancing nutrients like cinnamon, green tea and alpha lipoic acid. Staying relaxed: Stress is a major unrecognized contributor to insulin resistance and blood sugar imbalance. Deep breathe, do yoga or indulge in any other relaxation techniques. Get moving: Other than altering the diet, exercise is probably the single best medication for diabesity. Walk for at least half hour every day. 30-60 minutes of vigorous aerobic exercise 4-6 times a week is necessary. Getting clean and green: Environmental toxins contribute to diabesity. Filter water, look for green cleaning products and avoid plastics wherever you can. Getting personal: Additional steps to optimize key areas include seeking out biological imbalances and looking for ways to address them. Getting connected: Research indicates that we can improve the quality of recovery more effectively by getting together with friends, families and neighbors to change our diets and lifestyles. Eat three healthy meals a day including a nutritious breakfast. Swap high calorie foods with high nutrition lower calorie foods. Lose weight if you are overweight. Even a moderate loss of 5-7 % of body weight can make a big difference. Inactivity increases diabetes risk. Every two hours spent on watching TV or being idle increases the chances of diabetes by 14%. Instead brisk walk for half an hour every day. Quit smoking. Those who smoke increase their diabetes risk by 50% as compared to non-smokers. Keep alcohol consumption under moderation. Monitor disease progression by getting blood glucose level checked as per instructions of healthcare provider. If tests show that you have prediabetes, it is high time to make those diet and lifestyle changes. First Published Date: 14 Dec 2015 Last modified Date: April 18 2019 This page may have been updated recently as new information is available or the content may have been edited for better readability.